tl;dr: My blog is moving to civilityandtruth.com. Update your bookmarks and news readers! After a fair amount of fiddling about I’m renaming my personal blog and moving to a new domain. From now on you can access the blog at https://civilityandtruth.com (note the “https” rather than “http”). You can read more about the changes in my first post at the new blog. Briefly, I wanted to separate the blog from my personal domain frankhecker.com and have more control over the technology behind the blog, including eliminating the user tracking done by WordPress.com and providing better support for posts that include programming code and mathematical notation. I have moved all of my old blog posts from frankhecker.com to civilityandtruth.com, although some of the older ones have minor formatting glitches I have yet to correct. For now you can access old posts at the frankhecker.com URLs, but sometime in October (once I finish fixing any formatting problems) I will have all URLs pointing to frankhecker.com posts automatically redirected to the posts on civilityandtruth.com. The bottom line is that if you have linked to any of my old frankhecker.com posts those links should continue to work both now and in the future. However if you use news reader software (e.g., NetNewsWire) or a news reader service (e.g., Feedly) to read my blog posts then you should reconfigure your software or service to use https://civilityandtruth.com/feed.xml as the feed URL for the blog. I may be able to redirect previous feed URLs, but I cannot guarantee this will work in all cases. Finally, an important note: The new blog does not support comments (for a number of reasons); instead I’m expecting people to comment on Facebook or Twitter, or just to send me email. If you really don’t like this and would much prefer to comment directly on blog posts, drop me a line (or post a comment below) and I’ll consider changing my decision. Thanks to all of you who have read my blog over the years; see you at civilityandtruth.com! This entry was posted in howardcounty, site and tagged blogging, civilityandtruth on September 7, 2015 by hecker. I’ve previously written about Howard County’s initial foray into publishing government data, the data.howardcountymd.gov web site created by the Howard County GIS division. As announced by the county and reported by Amanda Yeager at the Baltimore Sun , Howard County has launched a new site opendata.howardcountymd.gov to provide access to government data. 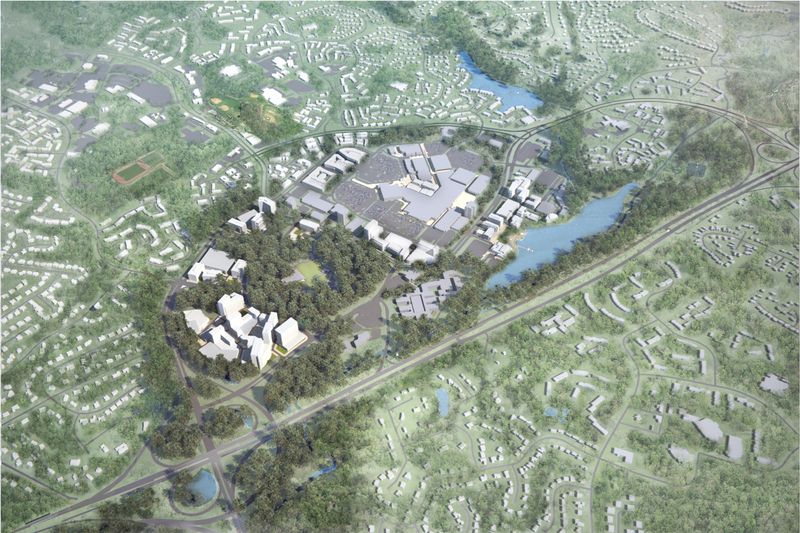 This new site, also known as the OpenHoward portal1, can be considered as a concrete implementation of open data practices mandated by the Howard County Council (see Council Bill 32-2014) and as a down payment on County Executive Allan Kittleman’s campaign promise to create an automated system (“HoCoStat”) to “help government increase responsiveness, improve efficiency and heighten accountability”. Finally, what will happen to the existing data.howardcountymd.gov site? Will its data be folded into the OpenHoward portal and the original site decommissioned, or will it continue to operate? I confess to a personal interest in this, since I’ve previously published analyses that pull datasets from the older site, and if the old site goes away I’d like the web links I used to be redirected to the new site. 1. Although both the county press release and the Baltimore Sun article reference the OpenHoward name, the actual web site doesn’t use that name. Maybe they’re still finalizing the logo and related branding? 2. Based on the figures on page 190 of the Howard County FY2016 proposed operating budget [PDF], personnel costs for the Department of Technology and Communication Services (the county’s IT department) appear to be almost $100,000 per employee on average. So a hypothetical subscription fee of $8,000 a month would be equivalent to hiring one new employee. 2. The Maryland connection goes beyond what I mentioned: Beth Blauer, who headed up the Maryland StateStat project, subsequently worked at Socrata for a couple of years before leaving to head up the Center for Government Excellence at John Hopkins University. 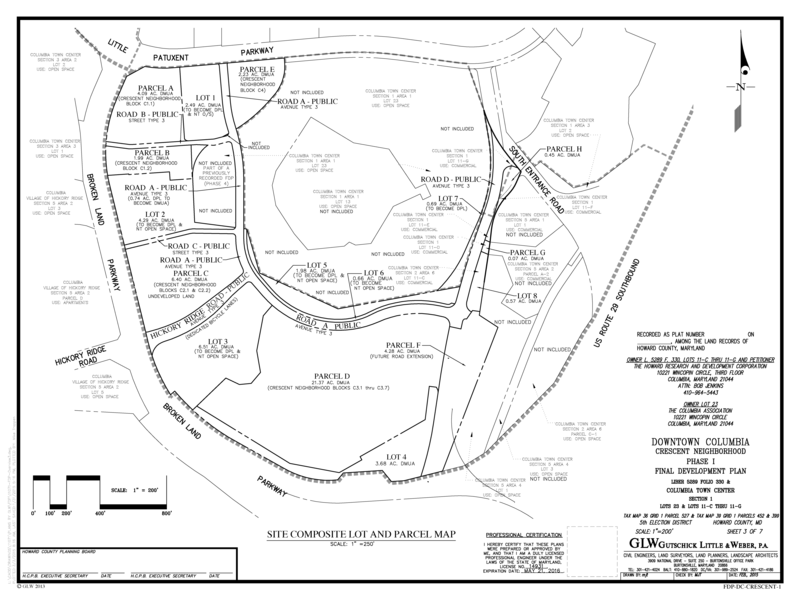 This entry was posted in howardcounty and tagged hocodata, opendata on May 11, 2015 by hecker. Howard County, Maryland precinct cartogram. Precinct area is proportional to the number of registered voters as of the 2014 general election. Click for higher-resolution version. tl;dr: The map of Howard County looks very different if you’re looking for votes. Cartograms help you see like a politician. The figure above is actually a map of Howard County electoral precincts, not as they exist in reality but as they might appear if their size were proportional to the number of voters they contain. More specifically, this is a cartogram in which the precinct map is distorted to make precinct areas proportional to the number of registered voters in each precinct as of the 2014 general election. Conventional map of Allan Kittleman’s election-day margin of victory in each precinct in the 2014 general election for Howard County Executive. Click for a higher-resolution version. 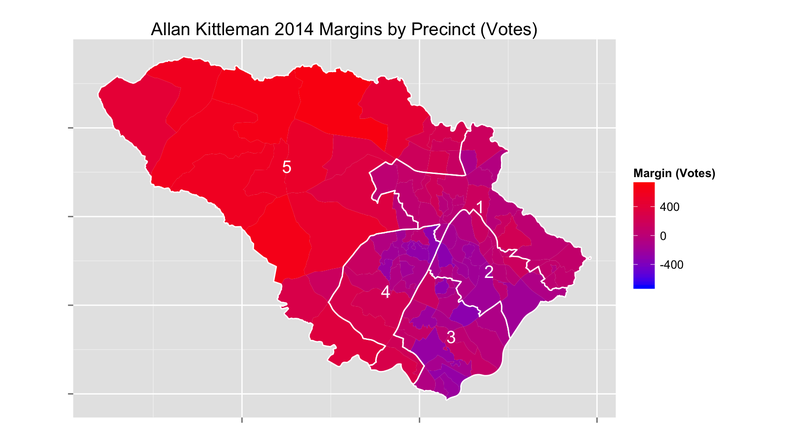 Each precinct is colored from bright red (large Kittleman margin) to bright blue (large Watson margin) and all shades in between. (Incidentally, this type of colored map is known as a choropleth map.) Since precincts in western Howard County are both large and heavily Republican the conventional map exaggerates the extent of Kittleman’s election-day victory margin over Watson. Cartogram of Allan Kittleman’s election-day margin of victory in each precinct in the 2014 general election for Howard County Executive. Click for a higher resolution version. To address this perceptual problem we can instead represent the exact same data in the form of a cartogram, as seen in the next map. Here the precincts of western Howard shrink in size to reflect their true contribution to the overall registered voter population. In particular Howard County Council District 5 now appears to be roughly equal in size to the other districts—which makes sense since county council redistricting had as one of its goals making the districts contain roughly equal number of voters. 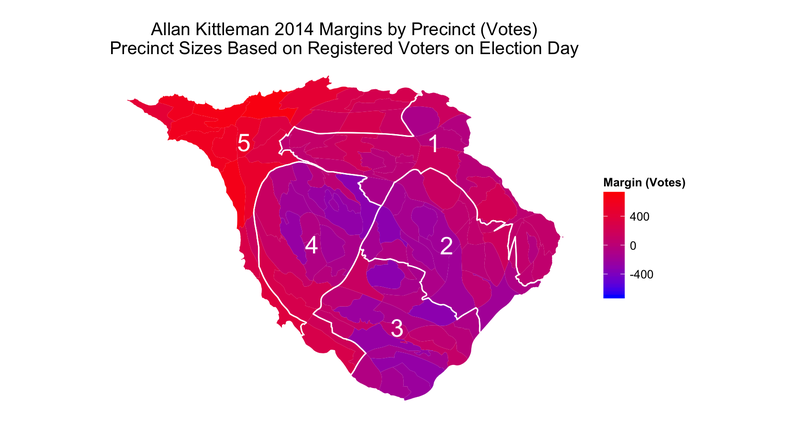 On this map Kittleman’s margin of victory still appears to be significant, but we can better identify precincts (like those in Columbia) in which Watson polled strongly on election day. Cartograms can be used in place of conventional maps in any context in which each geographic subdivision has associated with it some common variable of interest. For example, suppose we want to look at elementary school overcrowding in Howard County. Looking at a conventional map (like the elementary school attendance area map provided by the Howard County Public School System) we might say, “Gee, there are a lot of elementary schools in eastern Howard. How could they possibly be overcrowded?” It would make much more sense to show school attendance areas as a cartogram in which the size of each attendance area was proportional to the number of students in that area. Each of the attendance areas could then be colored according to the extent of overcrowding at that school. This sounds like a possible future project for me if and when I have time. Or if anyone out there would like to try this yourself, I’ve provided more detailed information on how to create maps like those shown above. See my three-part series “Creating Howard County Precinct Cartograms Based on 2014 Registered Voters” (part 1, part 2, and part 3) and my second three-part series “Allan Kittleman’s Election-Day Victory Margins in the Howard County 2014 General Election” (part 1, part 2, and part 3). This entry was posted in howardcounty, politics and tagged hocodata on March 21, 2015 by hecker. 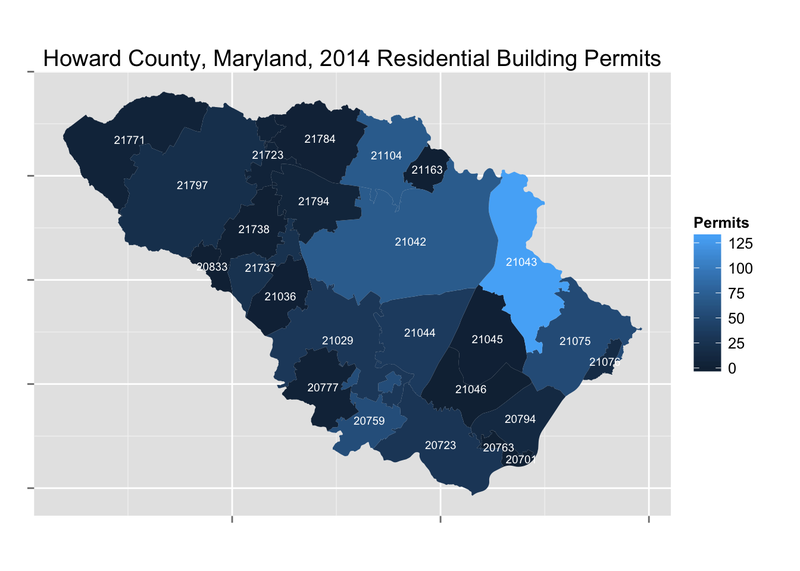 tl;dr: I have fun creating graphs and maps with building permit data from data.howardcountymd.gov. I’ve written previously about the cornucopia of interesting data sets that Howard County government has made available at the data.howardcountymd.gov site. I had some spare time over a long weekend and decided to try analyzing some of that data, including making use of the various map files on the site (under the “Spacial Data (GIS)” tab). To do the analysis I used the skills and the tools I learned in the courses that are part of the Johns Hopkins data science specialization series on Coursera. (See my Coursera-related posts for more on my experiences in these classes.) I won’t go over the process here since I’ve separately published full details on my RPubs page, with the source code available in my hocodata GitHub repository. I first created a simple table of the top zip codes for residential permits issued. This was sort of boring so I won’t reproduce it here; you can find it in the first example analysis I did. More interesting is the bar chart I created as part of the second example. It’s clear from the chart that there’s wide variation among Howard County zip codes in terms of residential construction. The two Ellicott City zip codes combined (21042 and 21043) accounted for the largest fraction of residential building permits in 2014; in contrast there were almost no permits issued for east Columbia (21045). However what I really wanted to create was a map showing exactly where permits were being issued across the county. The Howard County GIS division provides on data.howardcountymd.gov a set of map data for zip codes within Howard County. After doing a bit of research and experimentation, in my third example I was able to use this in conjunction with the building permit data to produce a map that is a nice alternative to the bar chart. First, this shows that releasing government data empowers people to do interesting things with it, especially when combined with free software and easily available online information and training. Maybe everybody isn’t interested in building permit data or any other individual government data set, but I suspect that there are a fair amount of people out there who are, including small businesses, nonprofit organizations, or just individual activists and interested citizens. Second, I did all this in a way that is completely reproducible by anyone else. How often have you seen a graph or map in a newspaper or government report and wondered, where exactly did that data come from? Wonder no longer: In my examples I start with the raw data as released by Howard County and show all my work in analyzing the data and creating the tables, charts, and maps. Finally, this is all reusable and adaptable. For example, suppose you have a better source of data on construction activity, perhaps one that gives the actual numbers of residential units, commercial square footage, and so on. You can easily plug that modified data into the analysis steps I’ve documented, and create better versions of the charts and maps in my examples. You can also reuse the overall technical approach for any type of data tied to a geographic area within Howard County. For example, in addition to zip code areas the data.howardcounty.gov site contains map data for Howard County school districts, election precincts, census tracts, and many other subdivisions of the county. 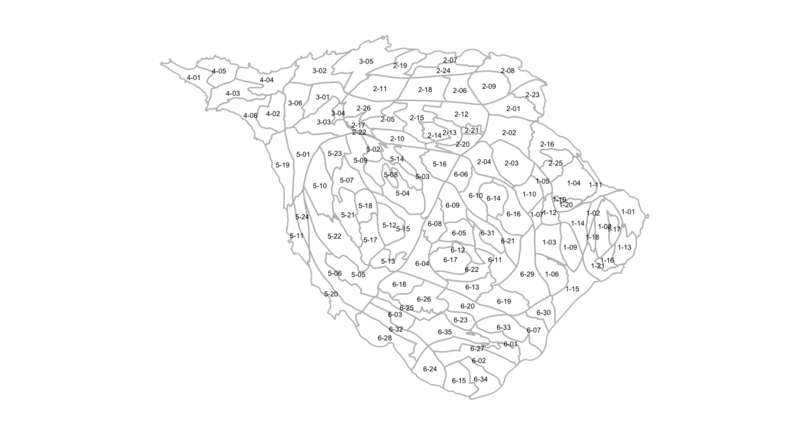 If you have data sets that are based on those subdivisions (for example, vote totals or turnout percentages for precincts) then you can adapt the code I wrote (all of which is in the public domain) to create your own maps showing how that data varies across the county. The bottom line is that the data is out there for the picking, as are the tools to make sense of it. You just need to spend some time learning how to use them or (if you don’t feel up to the task yourself) finding someone who can. Have fun! 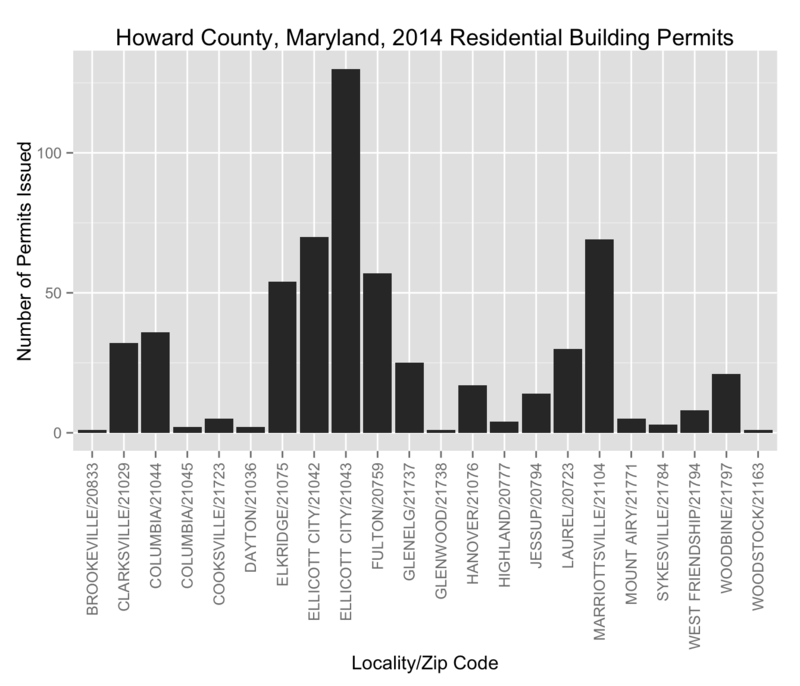 This entry was posted in howardcounty and tagged datascience, hocodata on February 16, 2015 by hecker. tl;dr: As we wait to hear more about Allan Kittleman’s HoCoStat proposal, you don’t have to wait to download lots of useful county-related data at data.howardcountymd.gov. This entry was posted in howardcounty and tagged datascience, hocostat on January 19, 2015 by hecker.